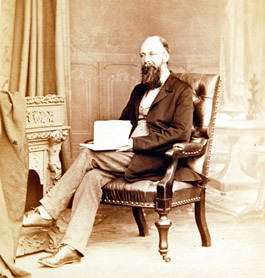 Robert Fitzroy is famous for publishing the first weather forecasts in The Times newspaper in 1860. Trained at the Royal Naval College, he entered the Navy in 1819. In 1828 he was put in charge of the ship The Beagle and in 1831 it was he who selected Charles Darwin to sail on the voyage of the Beagle. He became famous when he returned from this long voyage in 1836 and wrote an account of the trip, which included many references to the weather. Years later he was present during some of the debates on evolution that followed the publication of Darwin's book The Origin of Species. During his career he was elected a Member of Parliament for Durham in 1841 and became Governor of New Zealand in 1843, but was very unpopular and had to return to England in 1845. During the long voyage of the Beagle he had became aware of how important it was to be able to predict weather, and in 1854 he was appointed to the newly created post as Head of Meteorology at The Board of Trade (the Met. Office.) A terrible storm of 1859 led to the sinking of a famous ship and encouraged Fitzroy develop an idea for predicting weather by using charts. He gathered information from ships via the newly invented electric telegraph, which made communication swift enough people could be warned in good time that storms were on the way. In 1863 Fitzroy published his famous work The Weather Book to explain the science of meteorology. The Town Library has a copy of this and also of his account of the voyages of the Beagle.